My mom is one of my greatest partners in keto, and gosh darn it, she can make a mean breakfast bake! We usually save this for big family breakfasts, like Christmas or Thanksgiving morning before all the bigger cooking begins, and it’s also great for a simple Sunday breakfast as long as someone is willing to get up early to prepare it! In a skillet, cook bacon to crisp, cool, then crumble and set aside. Using the same skillet with the bacon grease, sizzle chopped red peppers and onions for about 3 minutes. Then add sausage to skillet with veggies and brown into crumbles. In a large bowl, combine eggs, heavy cream, salt, and pepper. Scramble. 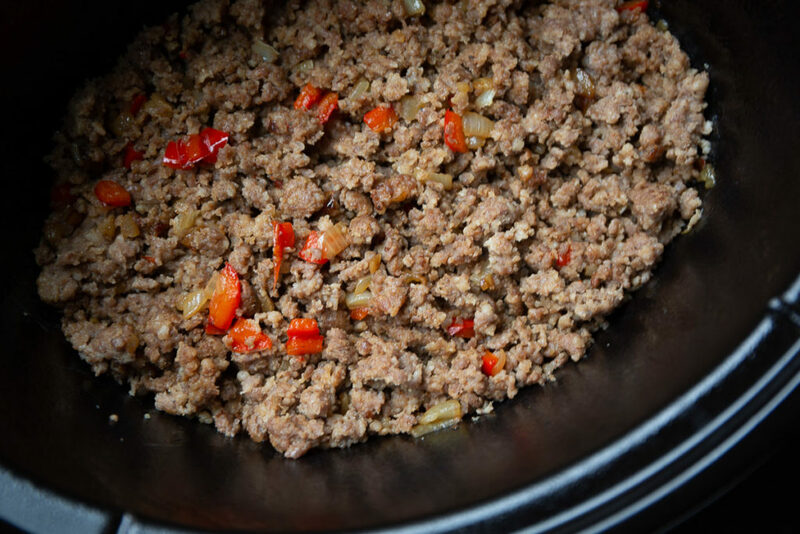 In a slow cooker, add sausage mixture to the bottom. Then top with 2 cups of cheese. Then top with egg mixture. Then top with 2 cups of cheese once more. Cook on high for at least 2 hours or until middle reaches 160 degrees Fahrenheit. Serve and enjoy. This recipe is great for a simple Sunday breakfast as long as someone is willing to get up early to prepare it! For a super Sunday morning breakfast add a serving of my Keto Cream Cheese Pancakes recipe. I’d love to hear what you think in the comments section below. This looks amazing! Do you have any suggestions for making this dairy free? Coconut milk is usually my go-to, but in this case it might affect the flavor too much.